Editor’s note: Tom Perriello is Center for American Progress Action president. He recently returned from the Turkish side of the Syria boarder, where he conducted interviews with Syrian leaders and refugees. The views expressed are his own. 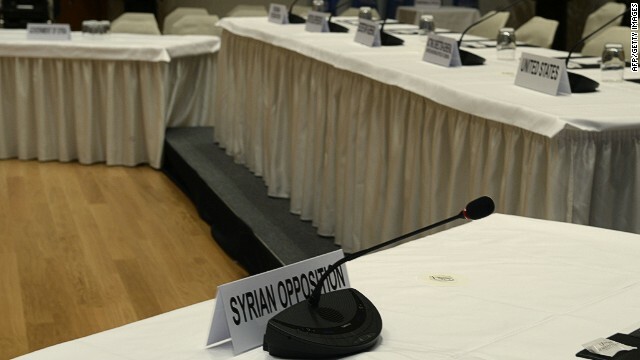 Expectations were low for the Syrian peace talks that started in Geneva late last month. Indeed, during dozens of interviews with Syrian leaders before talks began, the two words I heard most in reference to the conference were “trap” and “fake.” And I was among the skeptics, concerned that the Geneva process reflected more of a desire by the international community to look like it cared than an actual strategy. Yet while the initial talks produced no major breakthroughs, they have faltered in surprisingly constructive ways that clarify and advance the difficult choices the international community must face to address the crisis in Syria. And, with the announcement today that Syria will join a second round of peace talks next week, consideration of a course correction on U.S.-Syria policy could prove to be one of the outcomes. The opening round of talks clarified that Bashar al-Assad and his regime are the primary barrier to peace in Syria. Regime figures lashed out belligerently at United Nations mediators and refused to acknowledge that a civil war was even underway, referring only to their fight against terrorists. But new photographs of the regime’s torture campaigns and the barrel bombs that continue to fall on civilian areas leave little doubt about al-Assad’s willingness to brutalize his own people even while claiming to fight extremists. Most urgently, the regime backed off initial indications that it might allow humanitarian access to civilians long besieged in Homs. Still, even as it’s becoming increasingly clear that the al-Assad regime is standing in the way of peace, we are also seeing daylight between Russia and al-Assad. The al-Assad regime’s outbursts and opposition to humanitarian access has prompted Russia to privately express its growing frustration with its ally. An official from the Russian Foreign Ministry told me Russia is “embarrassed” by the al-Assad regime’s poor showing at Geneva. Even the Syrian Arab Red Crescent took the unusual step of calling out the failure to reach agreement on neutral delivery of humanitarian aid. This growing distance between Russia and the regime could create real pressure in future talks or increase the chances of a U.N. Security Council Resolution demanding humanitarian corridors in Syria. In contrast, it was the opposition – which at first refused to commit to the talks or name its delegates – that ultimately engaged substantively on questions of humanitarian access and a transitional governing body. In fact, it was the opposition that presented itself as a coherent partner for peace. This better-than-expected performance on the diplomatic front from the opposition reinforced new developments on the military front – the armed opposition’s recent declaration of war against al Qaeda factions across northern Syria. Despite dim prospects for a diplomatic or military breakthrough, many of the same Syrian opposition leaders who believed Geneva II was a rigged farce are now telling me they are cautiously optimistic about the international community’s role. However, these same leaders still expect al-Assad to reject any serious steps towards peace. There remains deep distrust and anger among many Syrians at the West’s failure to intervene with force, but Geneva II has begun to rebuild trust in ways that could be reinforced in subsequent rounds, if the West remains steadfast in opposition to the Assad regime and efforts to target civilians with bombs or starvation. Last year ended with Syria rapidly spiraling toward a worst case scenario: Al Qaeda safe havens across the north, al-Assad bombing and besieging civilians, moderate leaders killed or marginalized, and neighboring allies destabilized. But 2014 has begun with small breakthroughs and reminders that there are Syrians dedicated to a peaceful solution. Geneva II has not produced any concrete political solutions. But it has managed to resuscitate a sense of urgency in finding a post-al-Assad solution for the Syrian people while reaffirming the Syrian opposition coalition as a credible partner. Tragic situation in Syria. The same internal strife that left other mideast countries in a pile of rubble. Lebanon, Iraq, Afghanistan, and the countries of Arab spring uprising all have pent up despair. Too many families with brutal deathly experiences. The divide between the wealthy and the poor is widening. Bitterness, frustration, and guns are in abundant supply. "Barrel bombs" has entered the world's jargon, devices meant to kill and to frighten civilians. Indeed, Assad's representatives at the Geneva II talks were a pack of bums, making preposterous accusations that the West supported terrorists and claiming they had the best interests of the Syrian people at heart. Indeed, the Syrian Alawites, and the minorities that support Assad, but not the Sunnis. This is but yet another piece of cheap pro-Syrian opposition propaganda, a la CNN. If it doesn't sound appetizing, it is because it isn't... It is no secret that the US Congress has secretly approved funding for US arms deliveries to the "rebels" and that the CIA is actively running terrorist training camps in Jordan, which are infiltrating Syria from the South. Attempted regime change is in full swing, mind you. But the US effort is exhibiting ever-increasing levels of flatulence. And don't count on the Russians to do the West's dirty work.. I rarely leave a response, but i did some searching and wound up here . And I do have 2 questions for you if it's allright. Could it be only me or does it look like a few of these responses look like they are written by brain dead people? 😛 And, if you are writing on other sites, I'd like to keep up with everything new you have to post. Could you list of the complete urls of all your shared pages like your twitter feed, Facebook page or linkedin profile? I don't drop a leave a response, however I glanced through a few remarks on. I do have 2 questions for you if you do not mind. Could it be simply me or do some of the remarks come across as if they are coming from brain dead visitors? 😛 And, if you are writing at additional social sites, I would like to follow anything fresh you have to post. Could you post a list of every one of your social pages like your twitter feed, Facebook page or linkedin profile?